A Surprise from Social Media Dallas! This morning I found a package from Laurie Shook of Social Media Dallas. You know the feeling when you get an unexpected gift from a old friend? That’s how I felt. Laurie had taken the time to collect quotes from various Social Media Dallas members, print them out and stick them in a Scotty Vest. This vest has many pockets, so there were 11 cool quotes placed in 11 pockets. Two of these pockets had a crisp $100 bill with a quote from Benjamin Franklin. And one had a quote from Abraham Lincoln, accompanied by a $5 bill. Just imagine if I got a quote from Salmon P. Chase, who is on the $10,000 bill. In addition to speaking at Social Media Dallas (where we discussed the “Facebook for $1 a day” technique, I had the honor of teaching two SIG (Special Interest Group) classes. We covered the power of checklists, the 9 Triangles (core of everything we know), and how to build a proper social media plan. The following months had Scott Monty and Brian Fanzo as featured speakers, so we’re in good company. Thank you, Laurie, for being an amazing host and making me feel so welcome. Looking forward to the continuation of our training in Dallas! @SM_Dallas I’m there! Can’t wait to hear from @dennisyu and meet some fellow DFW #socialmedia folks ? 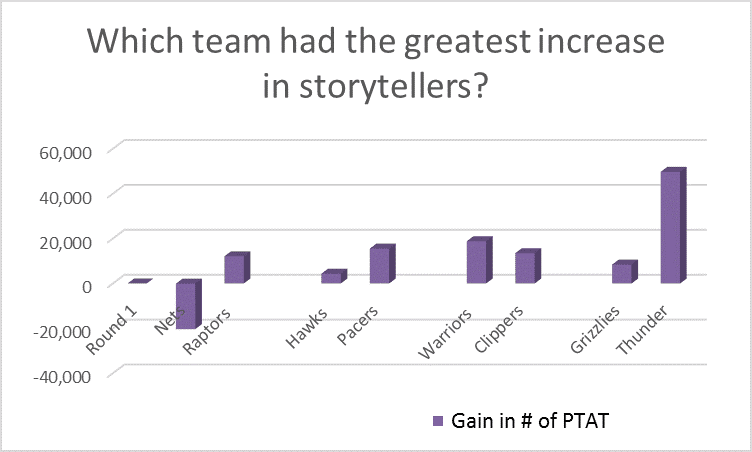 I recently visited California to meet with one of our clients the Golden State Warriors to talk about the analytics we ran for them. Dennis is at the top of the field. He drew the diagram above out for the head of analytics at the Warriors while I tagged along. Their head Analyst was talking about wanting to set up a “data warehouse”. After a long discussion on this, like really long, I learned that data warehouses may seem like a good idea, but for most companies it is not really needed. Let’s look at the diagram. Dennis drew this out because he could see that their discussion about whether a data warehouse was necessary or not wasn’t h itting through. So we went into a conference room and he drew it out. There are three columns, and although they’re labeled in the drawing, they’re kind of hard to see so I have labeled them down below the drawing. These three steps are MAA: Metrics, analysis, and action. In the left column is a visual of how information flows in a business with a data warehouse. A data warehouse is put in place so that when someone needs information (such as the number of tickets sold last year, how many per game. Or the number of ice-cream cones bought. Whatever the business and the need is) they can pull it from a location or “data warehouse”. 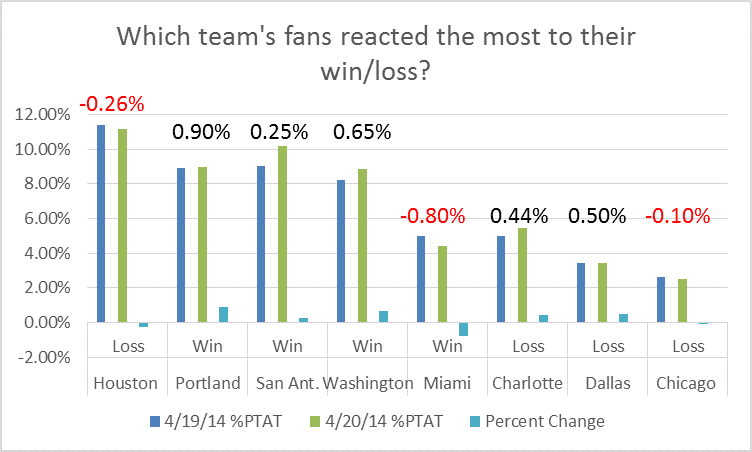 This information is our Metrics, or the numbers. This way they don’t have to go to different sources for information but can pull it out from one spot. This can be helpful to keep data reliable. If you have no data warehouse the risk is that in people will come up to the source for information and with a number of people asking for this information, numbers can be skewed. This is the Metrics of this process. With a data warehouse Information is more dependable and more easily accessible.One can take this information and do some analysis on the numbers received (middle column). Then one can make special offers based on analytics ran for example to receive greater business. For example, we can see what Golden State Warrior fans are commenting on and what their similar interests are in order to know which market to target. Targeted marketing done right can lead to greater conversion or greater sales and results in lower acquisition rates. When this special offer is made or something is done based off the numbers evaluated, this is action. So why shouldn’t every business pay to have a data warehouse? Doesn’t it sound great? Well if the objective is to boost sales then the more powerful route would be to take the information, analyze, and do something with the change in numbers that will lead to conversion (someone acts on the offer), a data warehouse may not really be needed. After this log discussion I could see that Brandon, the head Analyst was really stressing over this. His bosses wanted the warehouse of data, but he was starting to see that it was expensive and not really needed. The companies that seek data warehouses usually don’t need one. Perhaps large companies dealing with huge amount of information might direly need one but in most cases- it probably isn’t necessary. It costs a lot to set one up and can be a lot more trouble than its worth. If one can take the information and immediately convert it to sales through measuring, analyzing, and acting then that is the ideal process. How Do You Become the Most successful lawyer on Facebook? Just ask Jacob Sapochnick. Jacob has been so successful as a lawyer who happens to also know Facebook marketing, that he’s started to share his techniques with other lawyers. 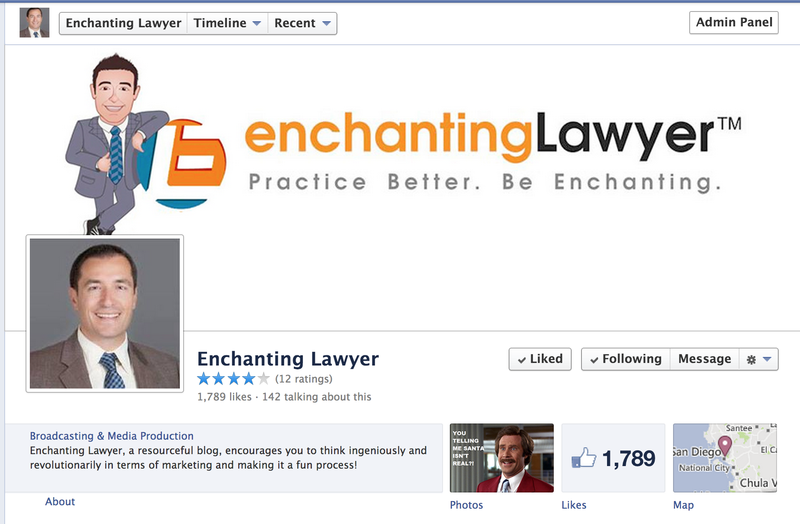 So he created the “Enchanting Lawyer” page. He has 1,789 fans. But more importantly, he has 142 PTAT (people talking about this). 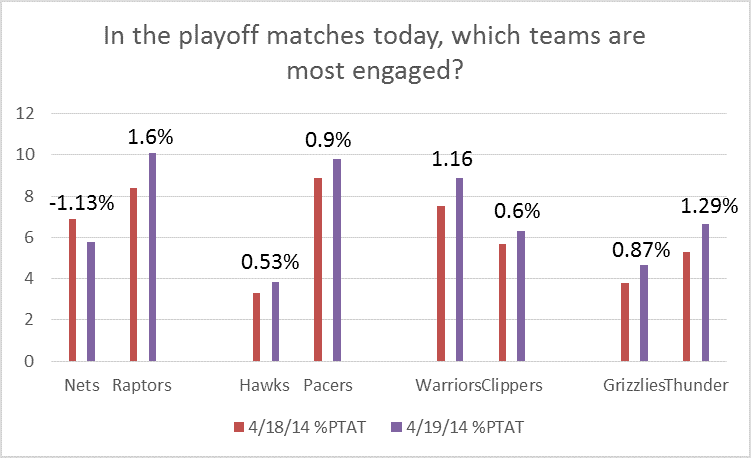 We care far more about engagement than fan count. Like we saw in his consumer campaign, he had a standard page like ad and a sponsored story (page like story). The sponsored story beats the standard ad, as we normally see– $1.23 per fan versus $1.49. But note that the standard ad generates more fans, since our fan base is still small. Sponsored stories don’t really kick in until you have a significant base of fans and engagement to amplify. The click-through rates on his sponsored story are triple that of his standard page like ad. But the CPM (cost per thousand impressions) of the sponsored story is also triple. Thus, the net CPC is similar. The higher CPM of the sponsored story is not necessarily “more expensive” or “bad”. It just means that under optimized CPM bidding that Facebook is choosing the placements that are most likely to convert. And newsfeed placements typically convert better for sponsored stories, as they appear to be more organic. First, we want to create separate campaigns for audience, engagement, and conversion. We don’t want to mix different objectives in the same campaign, since it makes comparison/optimization difficult. We advocate a campaign naming convention that starts with numbers, making sorting easier. So let’s create 1_audience, 2_engagement, and 3_conversion. I happen to like to name my ads and campaigns in all lowercase with no spaces. If you happen to program complex logic to scale campaigns like me, then this will come in handy for you later, since the database won’t choke on your ad names, even if you escape out certain text. Because he has two fan pages he’s promoting from his single account, we add the page number in the campaign. 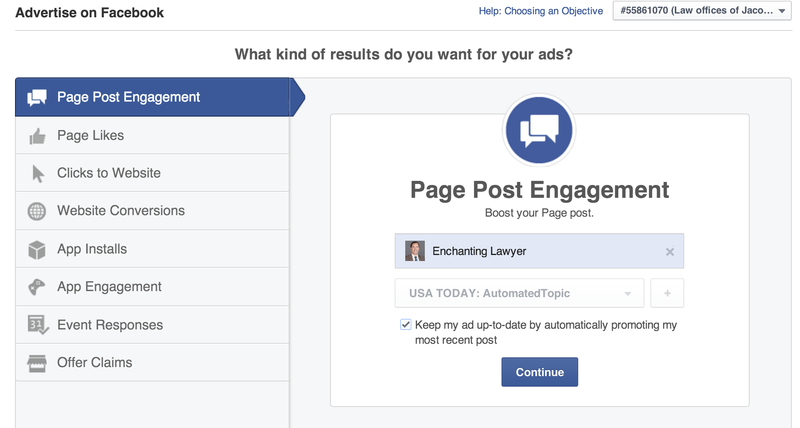 The workhorse ad we mentioned earlier is the page post engagement ad that is always on. Set your budget based on how many fans you need to nurture and how often you post. In other words, you should estimate the number of paid impressions you need to ensure consistent coverage. Like this. This “always on” ad is targeting just fans.Facebook’s new “gauges” ad estimator is showing 1,460 people in the United States. You can ignore the warning, since you’re going to create multiple ads. Use “create similar ad” in Ad Manager or use Power Editor (for the pros out there), as you make each new ad. When you start typing in “bar association”, you get “New York State Bar Association”, “Ohio State Bar Association” and other similar groups of lawyers. Don’t type in “lawyer”, unless you want to target people like this. Remember, this is Facebook, so “legality of cannabis” is not a surprise. Of these 240,000 lawyers, the ones who are friends of existing fans will convert better. So we’ll now duplicate this ad to reach friends of fans who are also lawyers. Now the audience is only 5,600 people, since our fan base is still so low. The ad not using connection targeting is going to have to carry us until we get enough of a base that word of mouth can really kick in. Of course, name your ads descriptively, so you know what you’re targeting on each one. Note that when the fan base grows, the friend-of-fan ad will automatically kick in. In other words, each new fan, on average, has 330 friends. So when your audience campaign generates another 100 new fans, you can automatically reach 33,000 more people. No need for you to do anything. But not all of the 33,000 new people you can reach with social context are lawyers, which is why we have the interest targeting on top of social connection targeting. Always. You should have some workplace targeting in your page post ads, since you want influencers to see your posts. That means the media, industry professionals, and anyone who think is important or would share what you have to say. This assumes you have a solid content strategy– content good enough to incite sharing. After all, you can’t make chicken salad out of chicken poo. Now we’re targeting by where people work, not what they like. So we’ve the local newspaper in San Diego, the American Bar Association, and a few other places that will amplify his presence with the media. Because Facebook doesn’t show ad targeting criteria, they will never know that these ads are just targeting the media. They’ll think you’re a major player. We’ve used this to great success the last few years. We targeted only 3,000 people here. Don’t worry about trying to get a big audience. Don’t even worry about generating clicks, since the prolonged exposure is how you establish credibility. In this rare instance, impressions are what matter, not clicks. Boosting posts is convenient (see below). But either you do that or run page post ads, since organic alone isn’t enough. Now it’s time to convert! The 3rd campaign is to drive conversions, whether it means driving a sale, lead, phone call, webinar sign-up, or whatever. Choose “website conversion”, not “clicks to website” The difference is that you must install the tracking pixel– not as huge of a deal as you might think, even if you’re not an engineer. You can set up multiple conversion pixels for multiple events and stages in your funnel. More here, if you want to really dig into action spec and other conversion tweaking.But you can safely ignore this if you’re not a high volume direct marketer. Because you’re sending traffic to your landing page, you’re going to need create “Google-esque” ad copy. That means multiple images of 600×315, headlines, and body copy. Facebook starts you off with your timeline cover, which is what they’ll show in a page like story in the newsfeed (one reason to be careful about your timeline cover). But you should add in a few more to test, since the one you wouldn’t expect to win, will win. Make sure they’re the right aspect ratio, since if you’re showing the newsfeed, your images will be too small. In the Ads Manager (regular web version), you can reposition your image. Not possible in Power Editor. And don’t violate the 20% text rule. And now we have some ad copy that promises value. In this case, a real lawyer sharing how he’s grown his practice on Facebook. Of course, you can’t say “Facebook” in the ads. We’re targeting just fans here, since we want to hit folks we’ve already nurtured in the audience and engagement campaigns. We are running this just in the newsfeed, but some folks have found better success (lower cost per conversion) by running the RHS (right hand side). You’ll need to test this for yourself. Lead gen experts– which of these practices are you using? Got any tips on how we can make our campaigns more effective?